Each spring semester, the Council on Community-Based Partnerships recognizes outstanding achievements in engagement scholarship. Students, faculty, staff and their community partners are honored for excellence in community-based research. 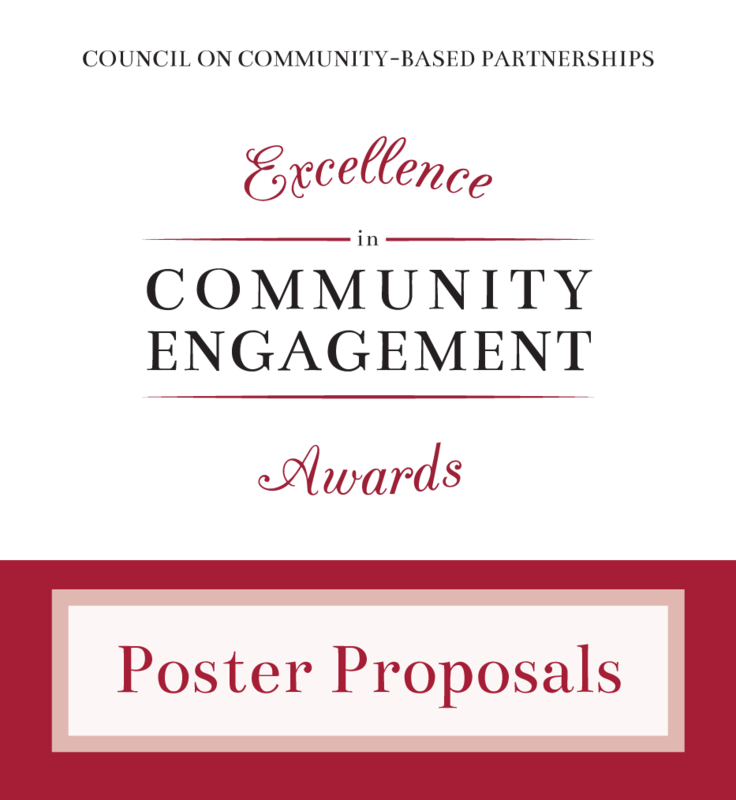 The Council on Community-Based Partnerships invites students, faculty, and community organizations to submit a proposal to present a poster at the Thirteenth Annual Council on Community-Based Partnerships Awards Luncheon, which will be held at the Ferguson Student Center Ballroom April 17, 2019. Proposals should describe community engagement research or relevant projects. For more information, please contact Dr. Andrew Goodlife, chair for the Academic Conference and Presentation Committee at amg@ua.edu or (205) 348-8283. The deadline to apply is 4:45 p.m., Friday, February 1, 2019. Notification to applicants will be made by Friday, March 8, 2019. Engaged scholarship combines the familiar traditions of teaching, research, and service in equitable partnerships with communities external to the campus. These partnerships have a goal of creating sustained, positive change in both the community and the academy. Engaged scholarship is reciprocal and is conducted in an atmosphere of mutual respect for, and understanding of, both partners’ strengths, weaknesses and needs. The ideal engaged scholarship initiative involves faculty and students in partnership with a community entity or entities. Submissions are encouraged that include, but are not limited to innovative designs, partnerships, community/institutional impact, curriculum development/assessment, service-learning, and civic engagement. Presenters are asked to set up their posters approximately 30 minutes prior to the session. Presenters are invited to register for the CCBP Awards Luncheon. Poster dimensions of 36” by 48” are recommended. However, attempts will be made to accommodate other sizes if needed. Posters will be displayed on tabletops. Therefore, it’s recommended that presenters use a rigid poster display, free-standing posters, or allow their posters to be pinned or attached to a firmer board which will be provided at the poster session. Easels will also be made available. Download a PDF of the rubric used for the Poster applications here.